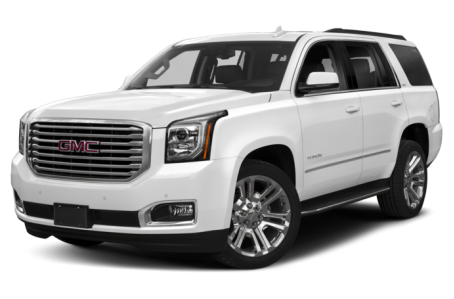 The 2018 GMC Yukon is a full-size SUV that seats up to nine passengers across three rows. It competes with the Ford Expedition and Lincoln Navigator. There are two available V-8 engines, one for SLE and SLT models and the larger reserved for the Denali. The base engine is new, part of GM’s new lineup of EcoTec3 engines. It is a 355-hp, 5.3-liter V-8 that makes 383 pounds-feet of torque mated to a six-speed automatic transmission. Denali models also get an EcoTec3 engine, a 420-hp, 6.2-liter V-8 that makes 460 pounds-feet of torque paired to an eight-speed automatic.